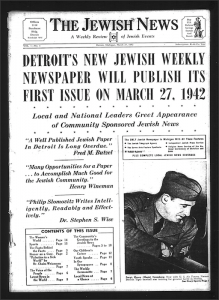 In recognition of the 75th anniversary of the Jewish News, the Foundation’s William Davidson Digital Archive of Jewish Detroit History has packaged “Top Stories” into a special feature for you. These stories will be added periodically to this site throughout the 75th anniversary year, which runs through March of 2018. SIGNIFICANTLY, you are now able to attach your own video, audio or written recollections of these “Top Stories!” Once submitted and accepted, your memories – or those of a family member – will become a permanent part of the Foundation site. The initial “Top Story” was the 1966 shooting and subsequent passing of Rabbi Morris Adler during Shabbat services at Shaarey Zedek in Southfield. “Top Stories” added to date include Soviet Emigration, the 75th Anniversary of the Detroit Jewish News, and the 1967 Six Day War. Future stories will include the 1967 Detroit riots, the 1942 founding of the Jewish News, World War II, the Holocaust and subsequent absorption of refugees, and Detroit’s historic Jewish demographic trends. Thank you for utilizing the Foundation’s website and the William Davidson Digital Archive of Jewish Detroit History and helping to assure – through your submissions and charitable contributions – that its contents will be available without charge to future generations for their edification and enjoyment! 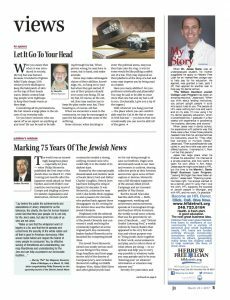 Whether it is to memorialize a family member or to celebrate a simcha, the Detroit Jewish News Foundation is blessed to have earned the support of a cross-section of the community. The Detroit Jewish News Foundation is an independent 501(c)(3) non-profit organization and your donations are deductible for tax purposes to the fullest extent of the law. For additional ways to contribute please contact Arthur Horwitz. Thank you for your donation to the Detroit Jewish News Foundation.